Our thanks to Gordon Crook for the information he has provided below. A very dignified memorial on a wall within the church of the Holy Cross at Cruwys Morchard - interesting because it is visible from so many seats. Names are carved on a slab of marble which is backed by a sheet of slate to create contrast. The Memorial records the place where each man died. 11026 Private James Bristow of the 9th Battalion, the Devonshire Regiment. Son of James and Emma Bristow of Cruwys Morchard. Born in Cruwys Morchard in the September Quarter of 1892. Died in France 4 October 1917 aged 25. 10834 Lance Corporal Frank Buttle of the 8th Battalion, the Devonshire Regiment. Son of Harry and Joan Buttle of Bickleigh, nr. Tiverton. Born in Hemyock (registered as Wellington) in the December Quarter of 1896. Died in France 25 September 1915 aged 18. 202199 Private James Headon of the 1st/4th Battalion, the Devonshire Regiment. Son of Joseph Blake and Mary Ann Headon of Westland Farm, Cruwys Morchard. Born in Rackenford in the March Quarter of 1891. Died in India 4 August 1918 aged 27. 202515 Lance Corporal Walter John Radford of the 1st/4th Battalion, the Oxford and Bucks Light Infantry. Son of Walter and Elizabeth Radford; husband of Edith (née Alford) of Little Silver, Cadeleigh. . Born in Cruwys Morchard in the June Quarter of 1894. Died in France 16 August 1917 aged 23. 11889 Private John Roberts of the 2nd Battalion, the Devonshire Regiment. Son of Samuel and Maria Roberts of Pages, Cruwys Morchard,. Born in Witheridge in the June Quarter of 1894. Died in France 30 May 1915 aged 21. 103408 Lance Corporal Charles Henry Rowe of the 255th Coy., the Machine Gun Corps. Son of Charlie and Mary Rowe, of East Whitstone Farm, Meshaw. Born in Templeton in the March Quarter of 1897. Died in France 10 December 1917 aged 21. 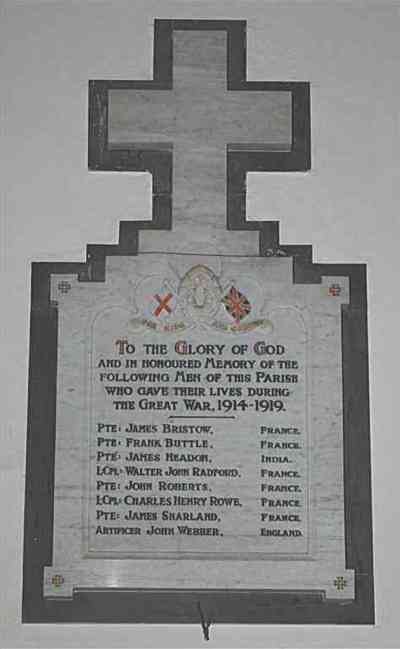 3/7863 Lance Corporal James Sharland of the 8th Battalion, the Devonshire Regiment. Son of James and Eliza Sharland of Cruwys Morchard; husband of Rose Sharland (née French), of Pennymoor, Cruwys Morchard. Died in France 25 September 1915 aged 36. Sapper Artificer John Webber of the Royal Engineers. Son of John and Ann Webber of Cruwys Morchard. Born in Cruwys Morchard in 1896. Died in Cruwys Morchard 8 October 1919 aged 24. Described on his death certificate as a naval pensioner, John was formerly Chief Petty Officer on HMS Hercules. It seems that he caught TB while in the Navy, came home with the infection and passed it to his sister who also died.